You are bidding on the PER EMBRYO PRICE!!! with a MAX. of 7 embryos. and is sired by Lightning Bolt, a son of White Lightning. Be watching for #51 Lightning Bell to be auctioned off on The Breeder's Connection at a later date. Contact the consignor for any questions concerning this consignment, BEFORE placing a bid. Highway to Bell is now deceased. The only bull in PRCA history to achieve this honor. 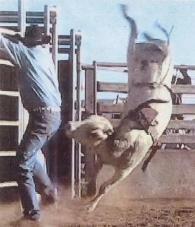 He was also the 1987 PRCA Bucking Bull of the Finals. Many people claim he was the rankest bull of all times.